Home » Featured » No Ice Needed For This Winter Fishing! If sitting on a five-gallon bucket and then staring at a hole drilled in the ice doesn’t meet your criterion for winter fishing, then take note! There is an open-water fishing option in Nebraska during the coldest part of the year and it involves trout. So, grab the neoprene waders and gloves, layer your clothing and rig the spinning rod, because we are going winter trout stream fishing! 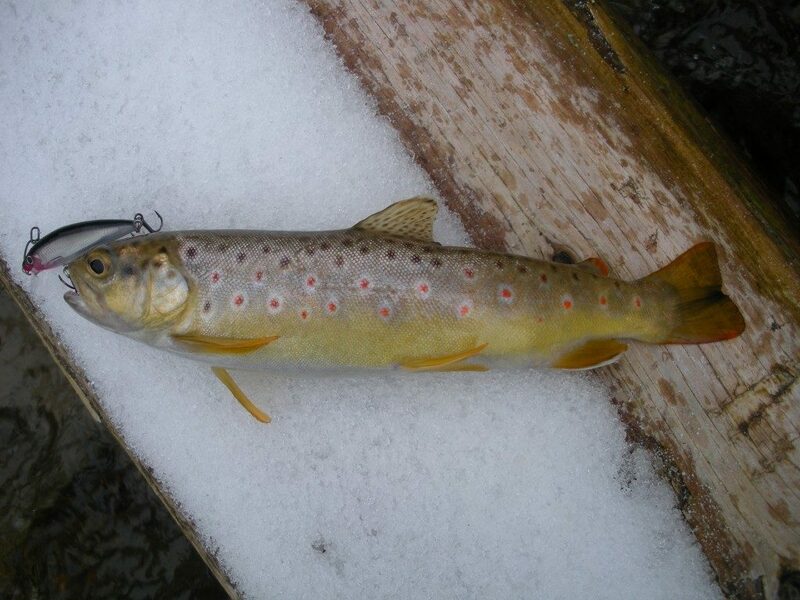 Schlagel Creek near Valentine, NE gives up a brown trout on a crankbait during a winter fishing expedition. Photo courtesy of Daryl Bauer/Nebraska Game and Parks Commission. Fed by groundwater springs, many of Nebraska’s trout streams, or at least stretches of them, remain relatively ice-free all winter. 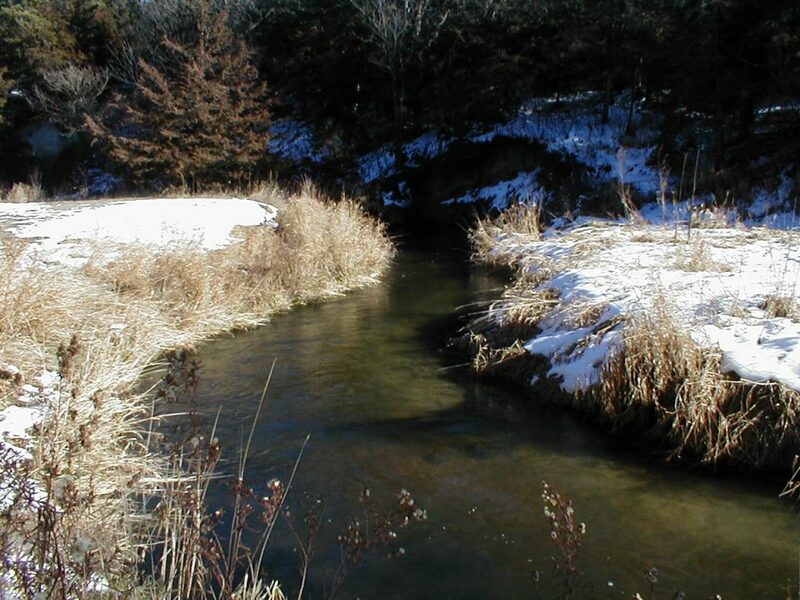 Long Pine Creek trout stream is shown in winter at the Long Pine State Recreation Area near Long Pine, NE. Photo courtesy of Andy Glidden/Nebraska Game and Parks Commission. And, guess what? The rainbow, brown and brook trout in these flowing waters can give you some fun fishing action on some nice winter afternoons, assuming you play your cards right, that is. 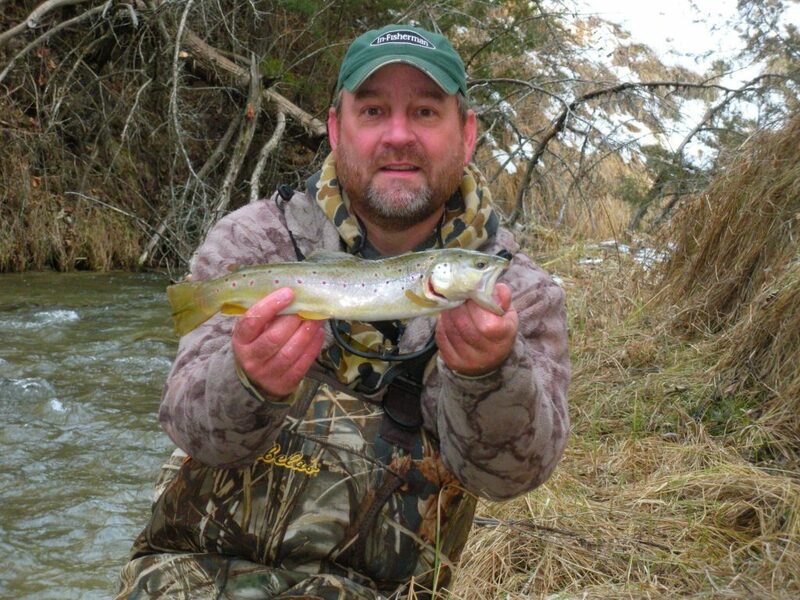 Daryl Bauer of the Nebraska Game and Parks Commission’s Fisheries Division shows off an attractive brown trout he landed on a winter fishing outing in the cold waters of Schlagel Creek near Valentine, NE. Photo courtesy of Daryl Bauer/Nebraska Game and Parks Commission. Daryl Bauer, Fisheries Biologist and the Fisheries Outreach Program Manager for the Nebraska Game and Parks Commission, offers these tips for effective winter angling in Nebraska’s trout streams which are found predominantly in the north and west (see the Trout Fishing in Nebraska Streams publication). Where are they in the water and do they put up a fight? The cold-water trout species feed less during the winter as their metabolism has slowed. In flowing water they tend to settle into some of the deepest holes and spots with the least amount of current during the winter to conserve energy. But, don’t be deceived, when hooked these trout will fight with almost the same vigor as those hooked in the summer! A hooked rainbow trout puts up a good fight in the waters of the East Branch of the Verdigre Creek flowing through the Grove Lake Wildlife Management Area. Photo by Greg Wagner/Nebraska Game and Parks Commission. Be stealthy, wear camo. When fishing for trout in streams, it’s best to work your way upstream (against the current) whenever possible. This is especially important when fishing for wild or spooky fish in clear water. Trout usually face into the current and will be less likely to see you approaching from behind. Wear camouflage clothing or “natural colors,” and try to avoid brightly colored clothing and hats. Move slowly and disturb the water as little as possible. A ball cap and polarized glasses will aid you when wading and for seeing fish and fish-holding areas. Trout have great eyesight, feel vibrations and are very wary in any of these streams as water conditions will be super-clear with lower flows. Think small to catch trout in winter. Trout in streams during winter eat a variety of prey, and in general all of the typical trout presentations can catch fish in the winter as well as in the summer. Of course, matching the actual prey the fish are eating is always a good place to start. This means going smaller for trout with more natural baits and artificial lures. Fly fish! Fly fishing can be highly effective during the winter months – a variety of beadhead nymphs are particularly attractive to trout in streams in the winter, but on a warm afternoon there most likely will be hatches of midges or other small insects and a fly angler can pick up some fish on dry flies or emerger patterns. Crankbaits, really? Small crankbaits can also catch trout in open water during the winter, however, they have to be fished quite slowly – usually just enough to get them wobbling. Frequent and extended pauses might also be needed to trigger fish. For that reason neutrally buoyant crankbaits that maintain their depth at slow speeds or even when stopped are often some of the best crankbaits for trout in streams. 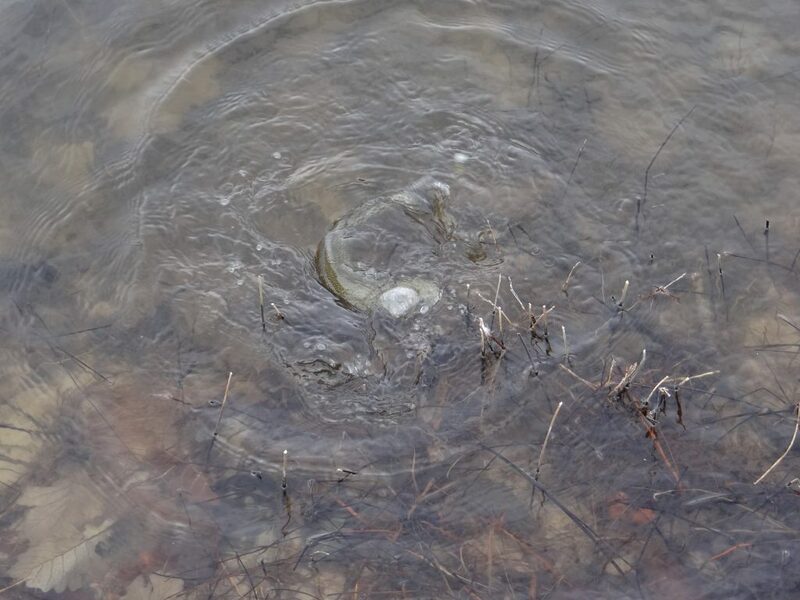 A winter brown trout is caught on a small crankbait from underneath a lunker box structure in the spring-fed waters of Long Pine Creek at the Long Pine State Recreation Area near Long Pine, NE. Photo courtesy of Daryl Bauer/Nebraska Game and Parks Commission. Other trout attractors. Waxworms, salmon eggs, prepared baits, small jigs, or tiny spinners or spoons (silver on sunny days and gold on cloudy days) should also not be overlooked for successful winter trout stream fishing. 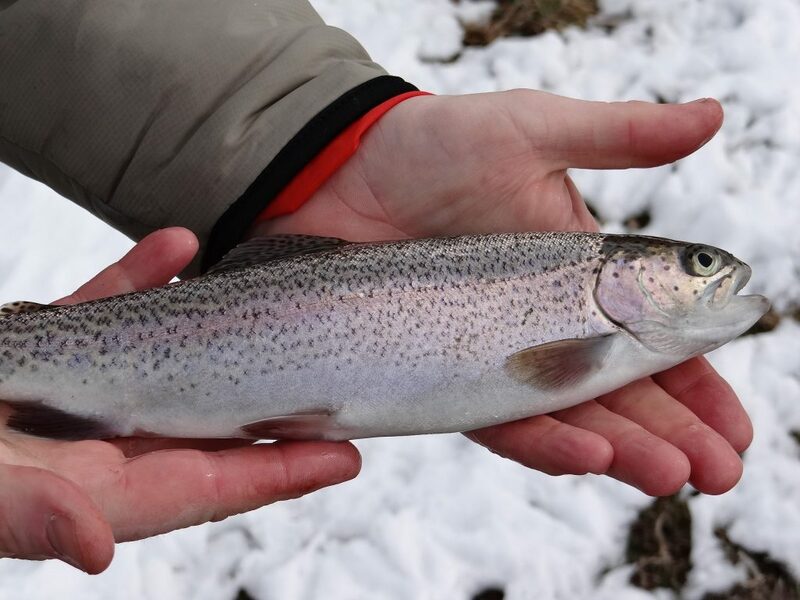 Your blogger displays a healthy rainbow trout caught on a waxworm in the winter from the East Branch of the Verdigre Creek at the Grove Lake Wildlife Management Area near Royal, NE. Photo by Noah Wagner of Omaha, NE. Fish when it’s warmest. The trout in these streams are more apt to take your lure or bait on the nice, warm winter days, either sunny or cloudy, when the temperature hovers around or rises above freezing. Skip the morning and head out during the peak daytime air temperatures – usually during mid-afternoon. Little competition. 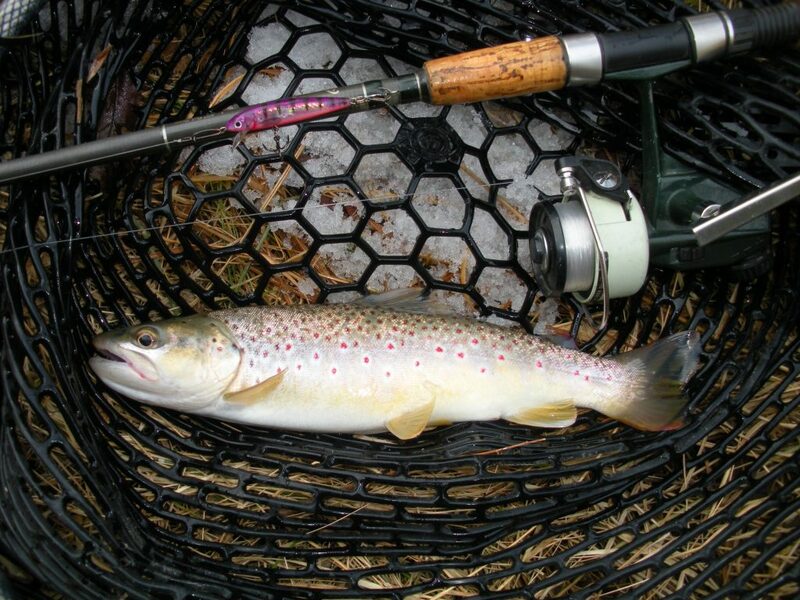 Don’t expect much competition to catch trout on public access areas along popular trout streams such as the East Branch of the Verdigre and Long Pine Creeks. There may not be anyone fishing these creeks on weekdays. Take camera phone pics! Winter can be a wonderful time of year for simply taking iPhone or Smartphone photos while fishing, particularly for landscape photography along streams. Familiar locations around you can be transformed by snow, ice or fog. And with the winter sun lower in the sky, you can capture wonderful light, amazing long shadows and stunning silhouettes. Plus, you can validate your catches! Angler, Daniel Bauer of Lincoln, NE, fishes the Snake River just below Merritt Reservoir Dam for trout on a pretty winter day. 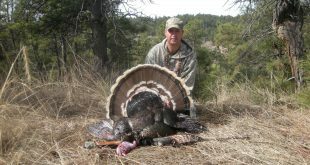 Photo by Daryl Bauer/Nebraska Game and Parks Commission. Know before you go. Be sure to check the current Nebraska Fishing Guide booklet for regulations pertaining to trout before you go stream side. There are no fishing regulation changes from 2017 to 2018. 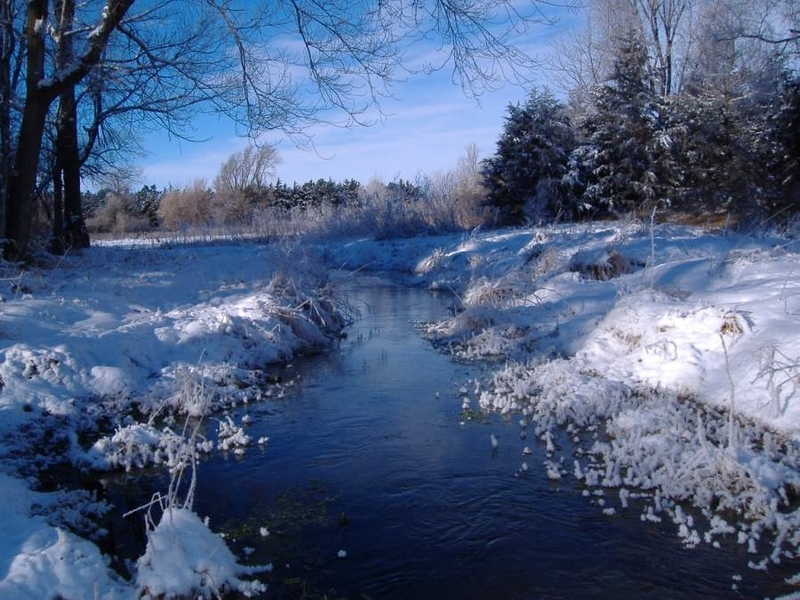 Also, do your homework and acquire landowner permission well in advance of your winter fishing trip if you plan to use private property access to streams. Selective harvest; put the big ones back. For conservation purposes, keep the more abundant smaller fish for a meal, but return the larger trout to the water to swim and spawn another day! It is vital to keep the fish you want to release in the water as long as possible, particularly in the winter, as the cold outside temperatures can harm and possibly kill them. Safety. 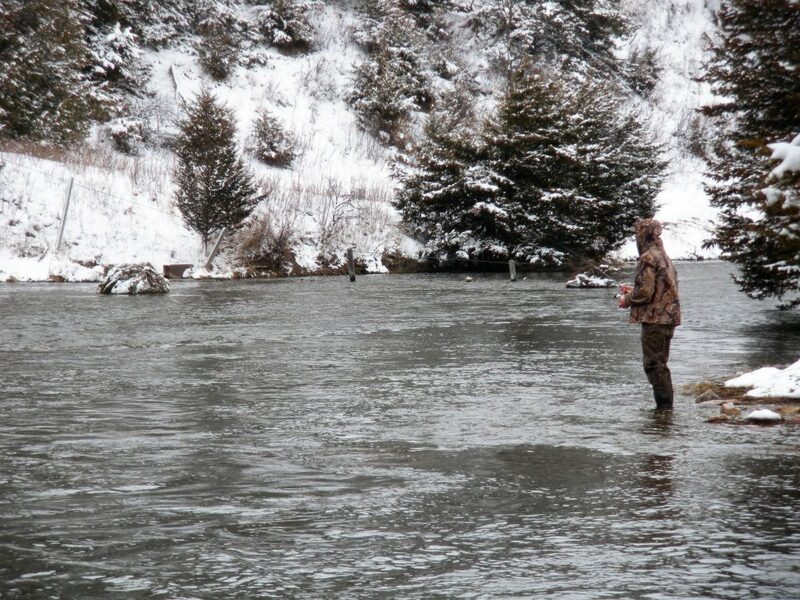 Although the splendors of winter trout stream fishing in Nebraska can be fantastic, the downfalls can be tragic. Slipping or falling into an ice-cold creek can mean more than just numb fingers and toes — it can mean hypothermia! Careful observation of the weather and water you are going to be fishing is a must. Pay close attention to weather reports. Pack a small survival kit. Bring a change of clothing. Winter weather can change rapidly and you could possibly get stuck out in extremely cold, snowy conditions if you are not prepared for them. Remember, always go with a partner and tell someone when you are leaving and expected to be back. With thorough planning and warm clothing plus the proper equipment and presentations, winter can provide some of the best fishing action of the year in one or more Nebraska’s pristine trout streams! Here is the East branch of the Verdigre Creek flowing through the Grove Lake Wildlife Management Area near Royal, NE after a winter snowfall. Photo courtesy of Bob Johnston of Elkhorn, NE who is a Nebraska Trout Unlimited Chapter #710 Board Member.